My life was semi-normal, until April 15 in this the year of our lord 2006. The day before Easter as a mayo mixture of fate and happenstance would have it. Up until that day, I had never known the enormous pleasures of the divine summertime nectar that is potato salad. Somehow I had made it 30 years without enjoying its goodness, and I now realize, without truly enjoying life. The next day I was still reeling with a mayo/celery/potato/mustard body buzz when a true Easter miracle shown it's face in the form of vocabularic one-upmanship. Perhaps this was a door opened to me by my new friend potato salad, perhaps just a coincidence, but that faithful Easter day was the first time I played scrabble. 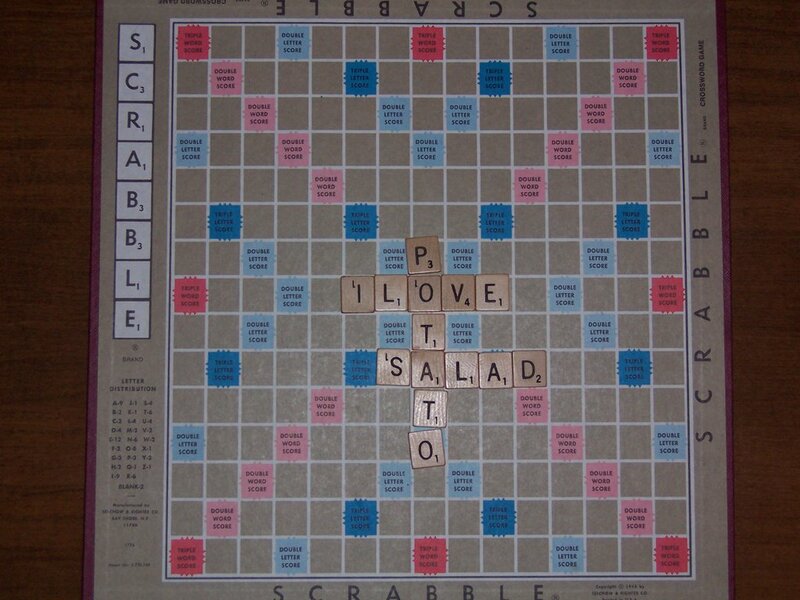 All I do anymore is eat potato salad and play scrabble! Before that wonderful day of wonderousness, I had never known the joy of placing the letters Z-I-O-N on the board (The Z on a triple letter score, of course). Just one day earlier, I had found a new mistress for my mouth, and here mere hours later I find another for my mind (How many mistresses can one man have for his head, you ask? *) This has to be the biggest thing to happen on Easter since the Easter bunny found Jesus in that cave still alive. Now, I am not going to get into the whole thing of "how could I have gone so long without, both potato salad and scrabble." I prefer not to think of it like that. 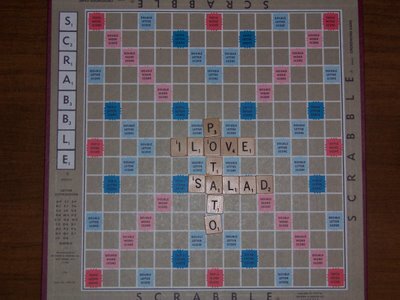 I prefer to eat as much potato salad as I can while I play as much scrabble as I can. I am still so giddy to do either one, and both whenever possible, that I have not yet begun to ponder the possible connection between the two. I have a hunch that it will blow my mind, but right now and for the foreseeable future, I don't need my mind blown. I just need to eat as much potato salad and play as many games of scrabble as I can. And just so you know, "zit" is not in our house rules dictionary, but delicious is. * the answer is 7.
how many possible point totals exist with the word "potatosalad" in the fourth quadrant of a circa 1982 scrabble board??? My sources at the North American Playability Knowledge for Interleague Novice Scrabble (NAPKINS) have informed me that Zion, being a proper name is not a legal play. I guess I'll have to consider that game a victory as well.